In a highly regulated environment, ensuring that you have up to date systems information at your fingertips is essential. This can be extremely challenging when there are many moving parts involved and a complete log of events must be kept and updated. Getting the right information to the right people and at the right time is key. 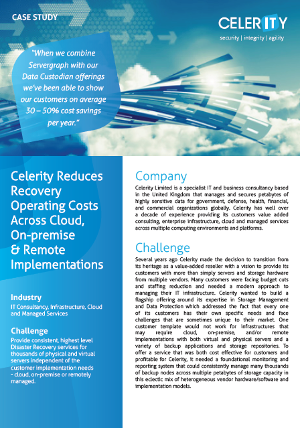 Celerity’s Reporting & Business Analytics module, part of the Custodian solutions suite, makes it easy to see and document what is happening across heterogeneous backup environments and simplifies audit preparation, whilst ensuring that regulatory compliance requirements and internal SLAs are met. The business intelligence functionality provides a fully customisable reporting solution that emails scheduled reports to your teams with the information needed to provide current operational support to the business. Custom Reporting – Tailored automated operational management reports delivered to your desktop. Efficient Audit Preparation - Ensure compliance with regulatory requirements and meet service-level agreements. Simplified Documentation – Removing the complexity of maintaining and understanding reporting data, customisable for different users: IT, Finance, HR, Ops, End-users and more. Trending Graphs – spot trends and make smarter, more informed decisions quicker – saving your organisation time and money! The Data Custodian web portal provides a feature-rich reporting engine with drill-down capabilities delivering complete data protection information and status.